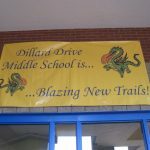 Home » Blog » News » Dillard Drive Middle School. All Booked Up. 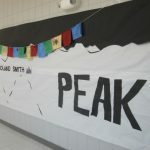 Apex, NC. I was at Dillard Drive Middle School yesterday speaking to their wound up 6th and 7th grade with librarian Jennifer Cassidy. Great bunch of young people and big fans. In the evening I did a signing at “All Booked Up” in Apex owned and operated by Shiloh Burnam and Janice Monaco. A good crowd showed up on a beautiful evening. If you’re ever in Apex (a beautiful little town) drop into this bookstore. It’s fabulous! Right next door is a pizza place with genuine NY cheese pizza. I took 3 slices back to the hotel with me. I was picked up and driven to the bookstore by Chris Martin who is in the store’s parent/child book club. Their read for February was “Cryptid Hunters.” Chris had his two kids with him. Lily wearing a Beatles T-Shirt. And Jack, hobbling along on two bad knees and a black eye caused by a soccer collision that afternoon 3 minutes into his game. His team won. Got a call from my good friend, author Pam Ryan (actually she’s my sister). She was stranded in Chicago trying to get to somewhere. I know exactly how that feels. It was great to hear from her despite her flying troubles. Her new novel just came out, which I’m going to save for a separate post. Pam Munoz Ryan is your sister!!! Really? The kids had a fantastic time. The books are still selling like hot cakes on a Sunday morning. Thank you so much for taking the time to come see us – it was an absolute pleasure!